Politics • Movement's future is hazy after moderates flood GOP caucuses. Paul Fraughton | Tribune file photo. 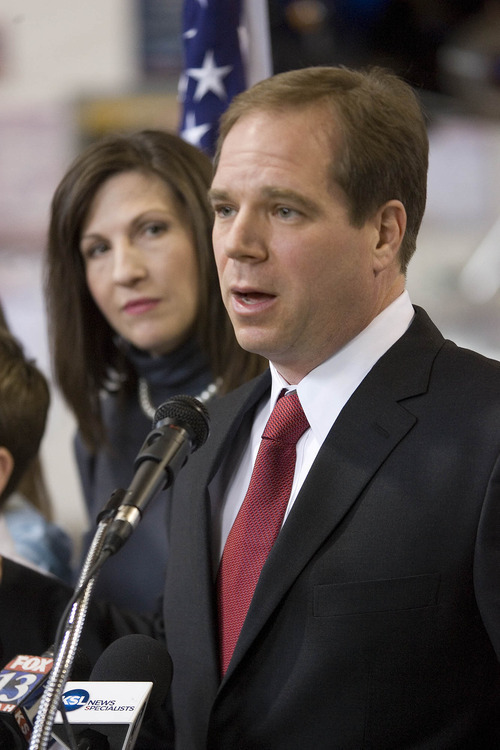 David Kirkham, with wife Alisa, announced his run for governor at his motor sports business in Provo on Jan. 18. 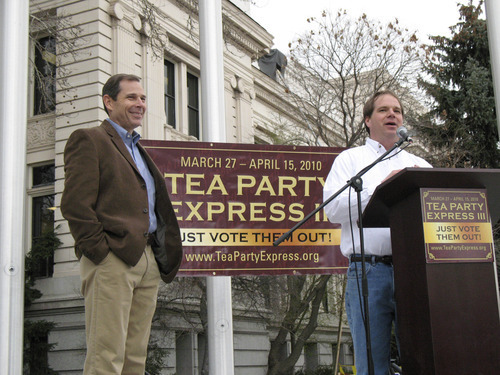 Tribune file photo David Kirkham, right, introduces Provo Mayor John Curtis at a tea party event in Provo last year. Trent Nelson | Tribune file photo The future of the tea party movement in Utah is unclear now that thousands of new delegates were elected at GOP caucus meetings in March. Some poliitical observers think the conservative tea party has lost its clout because of the push by the LDS Church and campaigns to spur turnout in the neighborhood caucuses. 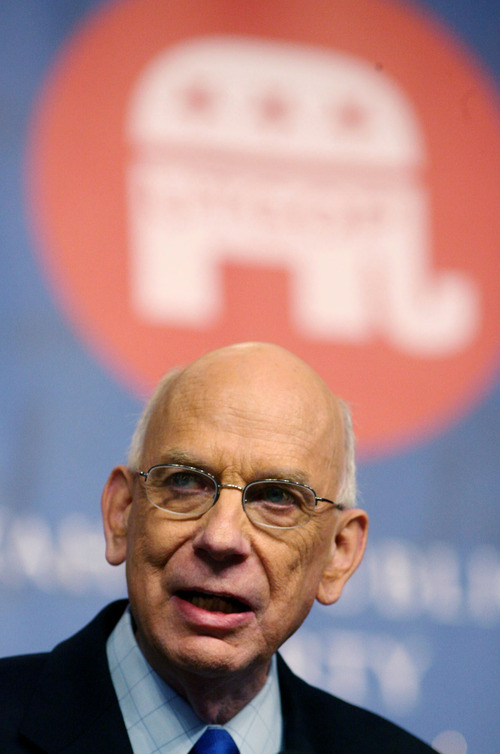 Steve Griffin | Tribune file photo Utah Sen. Bob Bennett talks to delegates at the 2010 GOP state convention. He was denied the nomination for a fourth term in a tea party-led revolt from the establishment. 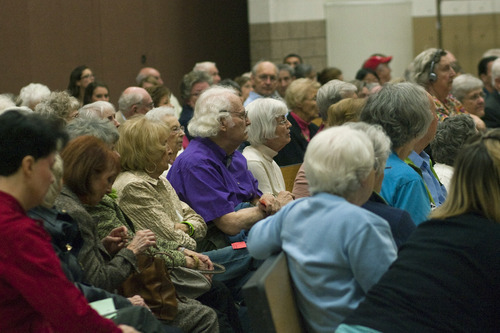 Chris Detrick | Tribune file photo Registered Republican voters crammed into caucus meetings in neighborhoods atround the state in March, an unprecedented turnout that is expected to dilute tea party clout in the GOP. 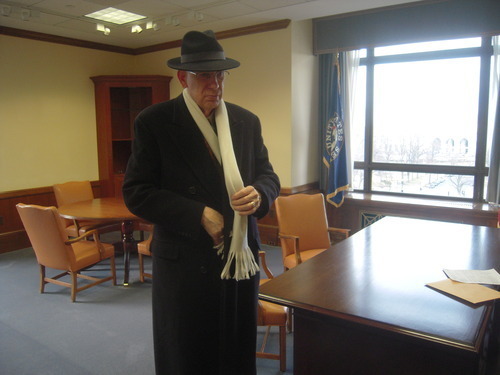 Thomas Burr | Tribune file photo Sen. Bob Bennett prepares to leave his now-empty Senate office for the last time after being ousted by tea partyers at the 2010 Utah Repubican Convention. Bennett thinks this year's new crop of delegates has iced the boiling tea party movement. 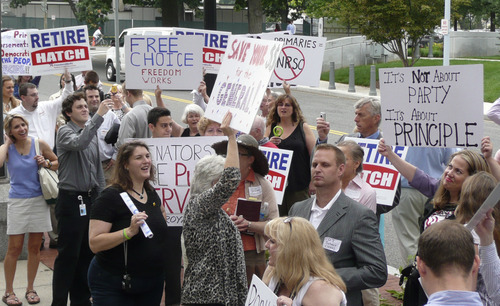 Matt Canham | Tribune file photo Utahns joined with other tea party activists in Washington, D.C., last summier in a protest against the National Republican Senatorial Committee's support of six-term Sen. Orrin Hatch. 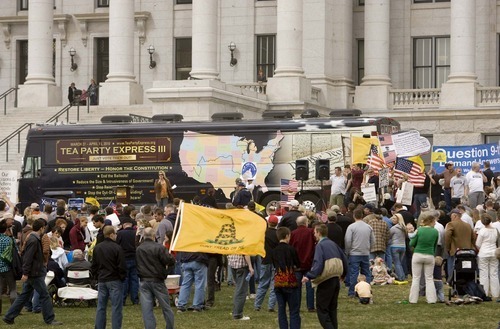 Trent Nelson | Tribune file photo The Tea Party Express made a stop at the Utah State Capitol last year, waving the Gadsden flag that has become associated with the conservative movement. At the Republican state convention two years ago, feverish delegates draped in yellow Gadsden flags that read "Don't Tread on Me" whooped and celebrated as a wave of conservative insurgents bounced Sen. Bob Bennett from office. It was the apex of the tea party movement, which rose out of frustration with federal spending, packed the GOP caucuses and dominated the nominating process with a resounding voice. Two years later, the tea that was bubbling and boiling over has been iced. Pleas from the LDS Church and various campaigns  including millions spent by Sen. Orrin Hatch  drove unprecedented turnout with more than 120,000 flooding the Republican caucus meetings and, it appears, drowning out the tea party insurgents and tempering the tone of the party. Bennett, whose smooth scalp has been the tea party's proudest prize to date, said that  while it may sound like sour grapes  from what he has witnessed and heard, there was a backlash against the tea party that was strengthened by the church turning out people who had never attended a caucus. "The perception was that: 'Church leaders probably hated what happened last time … so we came to see to it that Orrin Hatch isn't treated the way Bob Bennett was,'" Bennett said. He said that may not have been the church's intent, but its leaders had clearly made their position known on immigration, and it was counter to the tea party's stance. "There's a very strong subliminal connection … that says the church leaders don't like 'Don't Tread on Me.' They don't like, 'Take the country back,' " Bennett said. "The church, without ever saying a specific and explicit word in that direction, managed to send a very strong message: 'Guys, back off,' " Bennett said. "And the position they took on immigration is the most explicit thing they did. I think that went a long way toward taking the starch out of the tea party." Adam Brown, a political science professor at Brigham Young University, points to two tea party phenomena at the national level: First, polls show that support for the group has remained steady over the past two years; second, those that are not part of the movement are increasingly opposed to the group over the same period of time. "It seems to have maxed out its support two years ago," Brown said. Bringing that to the state level, he said, if support for the tea party movement was flat, but turnout overall spiked, those tea party supporters would make up a smaller segment of the GOP caucusgoers. "Two years ago the ones who came were the real energized ones and they were energized by the tea party," said Brown. "This year, they were back … but if you've got more people coming, they are going to be more of the traditional Republicans." D.J. Schanz, a supporter of the grass-roots, limited-government movement who ran for the state House in 2010, said it took a concerted effort from the church and hundreds of thousands of dollars from the Republican Party to drive the turnout. "You had the church leaders reading it and pleading with member four Sundays in a row to get out and basically dilute any fringe group, basically dilute the grass-roots movement," Schanz said. But politics is cyclical. "I think it's more of a flash in the pan." David Kirkham, a co-founder of the tea party in Utah and a candidate for governor, said he doesn't think the movement has lost clout since 2010. In fact, he said, the tea party has changed the debate to focus on controlling government spending and he believes that the 4,000 delegates elected at the party caucuses "are very much tea partyers," even if they don't use the name. At the same time, he said that members of the movement, rather than trying to force change from the outside, are now running for office themselves. "We all went and we rallied and we protested and we looked at each other and said, 'That's not how you get it done,' " Kirkham said. "The real fight is electing officials to the office. So it's not that we dispersed. It's that we went back into the party and back into the election." Rep. Jason Chaffetz, who was elected in 2008 riding the early incarnations of the tea party sentiments, said he thinks the message from the tea party is still resonating. 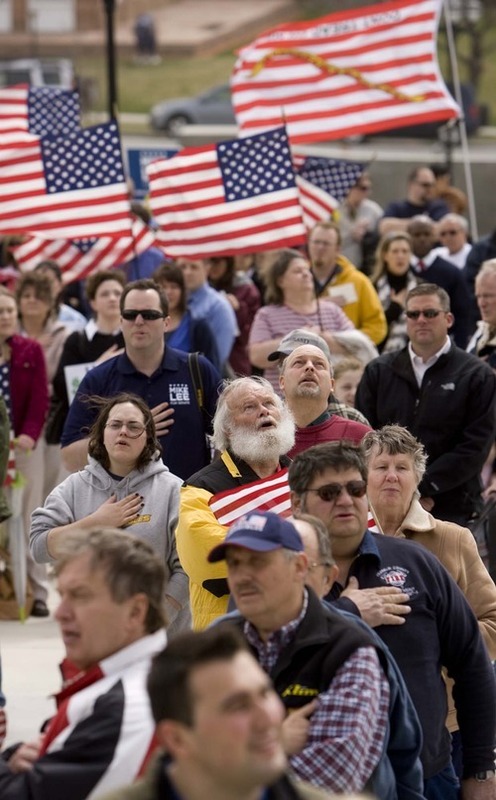 "The heart of the tea party is people getting … involved," Chaffetz said. "I didn't hear people going to their caucus meetings saying, 'Bigger government, more regulation.' "
Some in the conservative wing of the party have suggested changing the Republican Party's rules so delegates would be elected in odd years, before the election is in full swing. That way, the delegates would be elected based on their principles rather than support or opposition to a particular candidate. Forecasting the future is a tricky business, said Brown. If caucus turnout returns to normal in 2014, the party's conservative wing could again regain relevance, but recapturing its earlier energy might be difficult. "Eventually, we're going to settle back into politics as usual, I think," Brown said.